These are my rough research notes for the townland of Liscalgat. They are based on Griffiths and the subsequent Valuation Records. I have also appended information from the 1901 and 1911 census, and as well as facts from other sources. My purpose is to get a snapshot of the neighbours of the JACKSONs of Urker in the mid to late 1800s as well a snapshot of their relations, the GILMOREs of Liscalgat. Hopefully, this will also help other researchers seeking others who may have been neighbours. As always, I also hope to learn more. BACKGROUND: The JACKSONs first show up at Liscalgat when George JACKSON (1718-1782) was appointed schoolmaster at the Charter School at Liscalgat in the mid-1700s. George JACKSON's great-great-grandson, Sir Thomas JACKSON (1841-1915), left Ireland for Hong Kong, and although he subsequently became a wealthy banker and a baronet, he never forgot his roots. Like many of his neighbours, he had been born in a two room bungalow. The HEARTY family also can trace their residency in the townland at least as far back in time, if not further. Michael HEARTY and Sir Thomas JACKSON were both born in the same year, and most likely played together. In 1912, Sir Thomas had a new house built for Michael’s son, John HEARTY of Liscalgot. This is where the oral history and the Valuation Records fit together in ways that help us to learn more. Updated August 29, 2017. Major update including a map and more census and other facts. This map is based on one from Griffiths Valuations. The annotations are mine. The numbers on the various plots match up with the numbers in the Ordnance Survey Maps as referenced beneath. This makes it possible to physically locate the various lessees..NOTE: have a photograph of Richard ALLEN. He and David JACKSON were the main property owners in this townland. David JACKSON leased land and lived in the adjacent townland of Urcher aka Urker. His descendants continued to reside at Urker Lodge until the mid-1970s.. NOTE: Some of the changes in ownership were hard to decipher. For anyone whose research demands absolute accuracy, I suggest viewing either the physical records at PRONI, or the digital versions of the Valuation Revision books. Notes Strikethroughs reflect changes in the record. Italics indicate my additions from other sources. 1870 Lessee changed to Eliezer GILMORE (1843-1919) son of Samuel GILMORE. 1920 Lessee change to David GILMORE (1878-1859), son of Eliezer GILMORE. Richard ALLEN Esq. of 20 Sandforth Rd., Dublin of 1 pt & David JACKSON of Urker, Co. Armagh farmer of other pt. Lease of 76a 20p in Liscalgot. Curiously this lease is witnessed by John JACKSON of: “Antrim Co. Armagh” (surely, it has to be either Antrim or Armagh), farmer and Edward JOHNSTON of 20 Sandforth Rd., Dublin, Mercantile Clerk. 1906 Occ House John HEARTY NOTE: John HEARTY was in the 1901 census, age 30, as a Coachman and Domestic Servant. 1906 Lessee change to David JACKSON. Also change from Home to Office “Rm & Cl 29X16X10 @ 1 ¼ List wrong”. NOTE: This is curious since the David JACKSON who this would likely have been had died in 1903. NOTE: 1908 3A & #B is now listed with Patrick LOY as the lessee. 1905 Lessee change to James FAGHY NOTE: aka FAGGY & James FEAGHY in 1901 Census. NOTE: There were earlier McGEENEYs of Dorsey who were buried in Creggan Graveyard. NOTE: have a photograph of Richard ALLEN. Earlier McCOYs of Moybane were buried at Chreegan Church Graveyard. Census Records: NOTE: Religious affiliations, which sometimes shifted, are helpful in understanding other aspects of the community. It is worth noting that of the 20 households, 13 of the household heads were Roman Catholic, 6 were Church of Ireland, 1 was Presbyterian. I only noted birth places for residents if they were other than Co. Armagh. I have also recorded literacy in English and a knowledge of Irish. With elderly residents, I would caution against taking indications of illiteracy too seriously. Some may have had age-related sight issues. Also, I would not be surprised if there were more Protestants fluent in Irish than were noted in the census. For example, my grandmother Jeannie E. Browne was proud of her Irish fluency, but the 1901 census did not record this. John HEARTY (age 30) Coach Man & Domestic servant, age 30 & wife Mary Anne HEARTY (age 22). Son Michael age 1. All literate. His house was owned by Eliza JACKSON (1815-1903). It had 2 rooms, and 2 windows, and the roof was likely made of slate. NOTE: Creggan Graveyard: Ecce Agnus Dei; Most Sacred Heart of Jesus have mercy on the soul of our dear father Michael Hearty died 16th Sep 1908 aged 77 years and his son Patrick died 5th Sep 1904 aged 34 years; erected by his loving children: RIP. In loving memory of our dear father Michael Hearty who died 16th Sept 1908; also our dear mother Bridget Hearty who died 26th June 1923; also their son Thomas Hearty who died 15th Dec 1963 and his wife Mary E Hearty who died 4th Jan 1945; RIP,. erected by their loving daughter Mary, U.S.A. In loving memory of James Cumiskey, Carrive, Silverbridge, who died 4th Jan. 1980 aged 52 years. Rest in Peace. This family goes back to the early 1700s, and oral history suggests long before that. Creggan Graveyard: HEARTY Here lieth the body of Terce Hearty who departed this transitory life Octobr ye 13th 1755 aged 44 yrs: erected by his son Pattk Hearty AD 1786. IHS: Here lieth the body of Pattc Hearty of Cregganduff who depard this life Aug. the 4th. 1791 aged 44 yrs. Given that the 1766 census of Liscalgat included a Terence HERETY, I would suspect that the first Terence HEARTY had a son named Terence, or else the Census had a hiccup. John McGEENEY was a farmer, age 65 & wife Ellen was age 62. NOTE: There were earlier McGEENEYs buried in Creggan Graveyard from Dorsey. Anne McCOY was a widowed farmer, age 68 with two children: John & Patrick. NOTE: There were earlier McCOYs of Moybane buried at Creggan Churchyard. Peter FEAGHY (age 40), James FEAGHY (age 30) & Bridget FEAGHY (age 25)were unmarried nephews and niece of Catherine KEENAN. NOTE: See also FAGGY and FAGHY in Revision lists. Catherine KEENAN, widow, age 57 was family head. She lived with FEAGHY nephews and niece. NOTE: See other KEENANs in the Revision Lists. Owen KEENAN (age 60), Widower, Farmer. NOTE: See Owen KEENAN in the Revision Lists for Liscalgot. James COULTER age 60, farmer & wife Anne age 50. NOTE: The original COULTERs had arrived in the Parish of Creggan as Presbyterians in the 1700s. James COULTER married Anne KEENAN on Nov 28, 1884 in the Crossmaglen RC Church. His father was John COULTER. It is possible that he was a son of John COULTER and Margaret of Dorsey, born 1860, Feb 25. See: Creggan Church of Ireland Baptisms. The COULTERs and JACKSONs and GILMOREs were all interconnected by marriages. Owen MURPHY, age 11, was a servant in the COULTER’s household NOTE: See also Peter MURPHY, age 9, was a boarder with Rose & Bernard KEENAN in house 10. They may have been brothers. Rose KEENAN age 40 Dressmaker & brother Bernard KEENAN Labourer both never married. Peter MURPHY, age 9, was a boarder with Rose & Bernard KEENAN. NOTE: See also Owen MURPHY, age 11, was a servant in the COULTER’s household in house 9. They may have been brothers. Owen LARKIN was a widower, age 55, living with two adult sons, & 2 adult daughters. 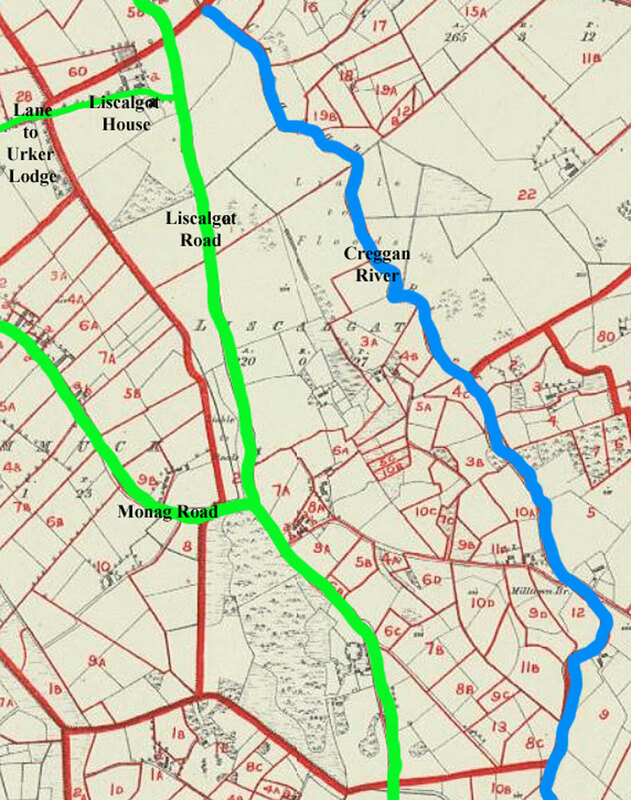 There was a Larkin’s Field 6.2.30 at Urker in a map from early 1900s. Owen LARKIN would have been both a neighbour and a contemporary of Sir Thomas Jackson. Eliezer GILMORE (1843-1919), wife Sarah GILMORE née JACKSON (1848-1942) & sons David GILMORE (1878-1959) & Thomas Jackson GILMORE (1887-1939). Catherine MULLIGAN, age 22, servant to GILMOREs. Mary QUINN, age 62 and widowed, sister-in-law of Ellen LOY. NOTE: Earlier QUINNS of Glassdrummond, Cullyhanna, Creggan & Shytrim aka Sheetrim were buried at Creggan Church. John McGEENEY (age 75), farmer; wife Ellen McGEENEY, age 76 & son Thomas McGENNEY (age 39). All literate, and parent knew Irish language. John McCOY (age 40), single bachelor, General labourer, illiterate. Catherine KEENAN (age 70) Head, widow, Irish language, illiterate. Owen KEENAN (age 78) Famer, widower, illiterate. NOTE: See Owen KEENAN in the Revision Lists for Liscalgot. James and Anne COULTER had been married 27 years, and had no children. NOTE: The original COULTERs had arrived in the Parish of Creggan as Presbyterians in the 1700s. James COULTER married Anne KEENAN on Nov 28, 1884 in the Crossmaglen RC Church. His father was John COULTER. It is possible that he was a son of John COULTER and Margaret of Dorsey, born 1860, Feb 25. See: Creggan Baptisms. The COULTERs and JACKSONs and GILMOREs were all interconnected by marriages. Rose KEENAN (age 64) & brother Bernard KEENAN (age 62) Labourer both never married. Both literate & Rose spoke Irish. NOTE: In 1901 Rose KEENAN was a dressmaker. Bridget MORGAN, age 14, was a border. Patrick LARKIN (age 30) farmer; Owen LARKIN (age 20) brother & farmer; Mary LARKIN (age 19). All literate & unmarried. John HEARTY (age 40) Farm Servant, literate; wife Mary Anne HEARTY age 35; Children: Michael HEARTY (age 11); Thomas HEARTY (age 9); James HEARTY (age 7); Bridget HEARTY (age 5) and Patrick HEARTY (age 2). The parents had been married for 12 years. The family was literate. His house was owned by Sir Thomas JACKSON. It was a 2 room house, with 2 windows in front, probably a slate roof, and walls of rock or concrete. NOTE: This is the family who Sir Thomas later built a new house for – probably later in the year.